Long ago we gave up McDonald’s, Burger King, and Taco Bell. Now when we want a good meal fast we head to Chipotle Mexican Grill. No eye rolling, no “what’s gluten?“—just a swift change of serving spoons and gloves and they’re off and running to build a satisfying gluten-free/dairy-free meal for my boy. Last week Chipotle had a booth at the Larimer County Farmers’ Market in downtown Fort Collins and they were giving away—yes, giving away—their salsa recipe. Okay, well “someone in the know” says this isn’t the exact restaurant recipe (it’s proprietary), but it’s a good “public version.” So I snagged it and came home and made a batch. I hope they don’t mind me posting it here. Chipotle, if you do, feel free to contact me and I will take it down ;). Chill at least an hour to allow flavors to blend. 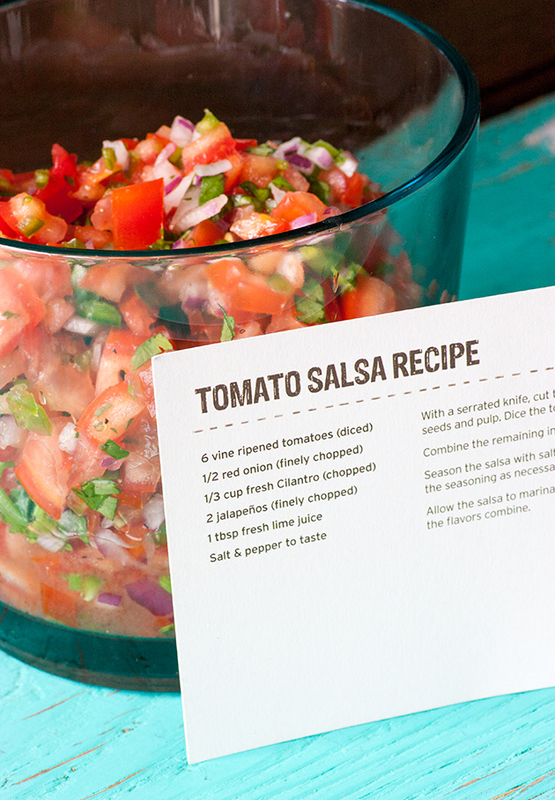 Serve with corn chips, over a salad, or in a burrito. Chipotle recommends cutting tomatoes into quarters and removing the seeds and the pulp before chopping. That really made a difference. We love Chipotle!! It is a special treat when we are able to eat out (something we don't do very often). We too gave up all the "other" fast food options for health's sake, but Chipotle . . . YUM!!! We need more restaurants like this for those days when we just don't feel like cooking. Nice shout out for Chipotle Restaurant!!! I zest the limes before squeezing the juice from them. I don't necessarily see this at Chipotle. I can always tell when I make this at home and forget the zest. What does that mean to "zest a lime?" Your recipe has changed my salsa-world! Make it all the time. We’re trying out a new farmers market today to see if we can get that "extra fresh" happening! LOVE LOVE LOVE this. Thanks! Are you able to can this recipe to have it taste garden fresh in the winter?